Just like we get in a meal planning rut, the same things happen with our fashion. We wear the same look over and over. How do we end that cycle, use what we have, and yet look like a million bucks? Accessorize! Immediately, most think of jewelry when I mention accessories, but today I am going to showcase the simplicity, sophistication and sass of the scarf. Whether your outfit was $10 or $1,000, scarves are a “must have” fashion accessory for the fall. By taking a T-shirt, long sleeve, dress or blazer, and then accenting it with a scarf, an outfit goes from simple to spectacular. I found two scarves last weekend at a yard sale for just $0.50. She had a few more that I put back, and I am now struggling with buyer’s remorse. For years, I had never been much of a scarf wearer. It required stepping out of the safe fashion comfort zone that I came to love, but I’ve realized it’s so worth it. 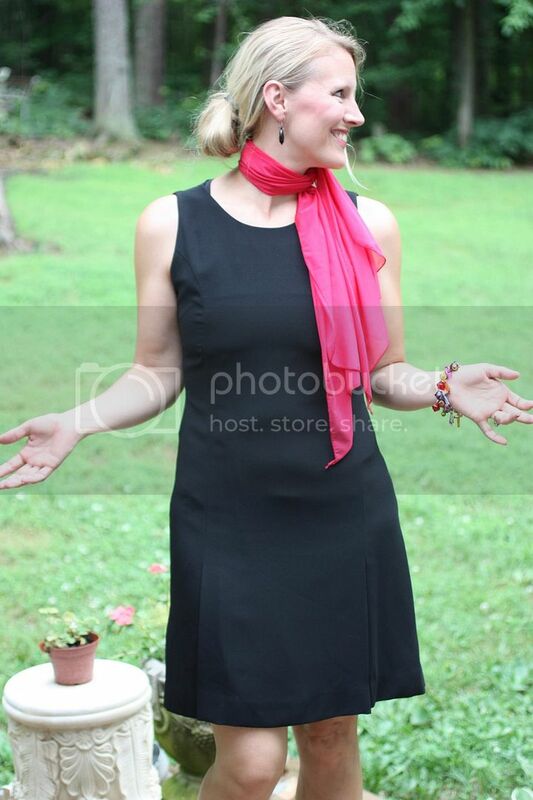 The picture below shows a very “easy to find” thrift store/yard sale outfit for me…for most of you. If you don’t know where to begin in the second hand hunt, I encourage looking for solid color shirts, as there are normally a plethora of them to be had. This Banana Republic black shirt was a $1 yard sale find, while the green Talbot’s pants I scored last week at the thrift store for $2.99. 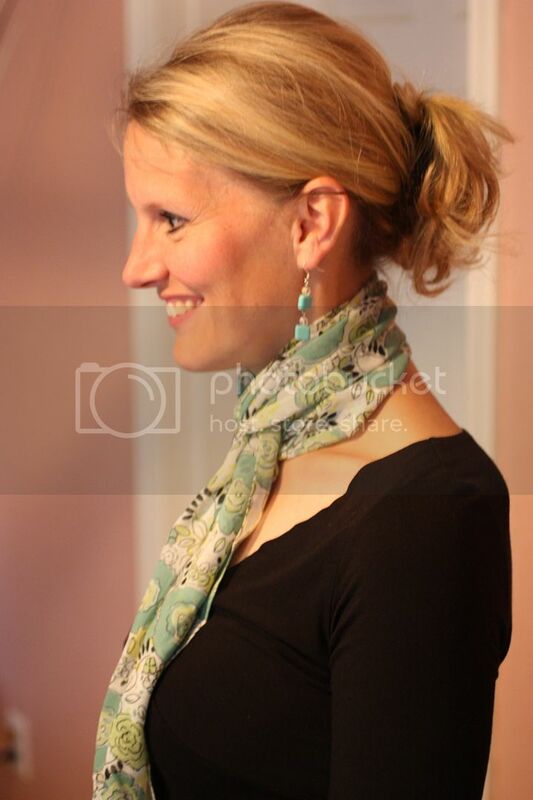 Paired with my $0.50 yard sale scarf and $1 dangling turquoise earrings, and it’s adorable at a total cost of $5.49 (and yes…I did wear shoes – cute turquoise yard sale ones :). As much as I love this shirt, it is a bit low for my more modest taste, so I either layer a tank underneath it or I utilize the scarf. This simple way of tying it, allows me to be totally comfortable without worrying if any cleavage is showing (what little I have left. :). With the scarf double tied around my neck and chest, this is the same outfit with the addition of a Talbots Good Will blazer find for $5. I just wrapped the scarf to the side. My sweet friend Leah is another frugally fabulous friend who shows again how easy it is to dress up a basic black Tshirt and jeans. 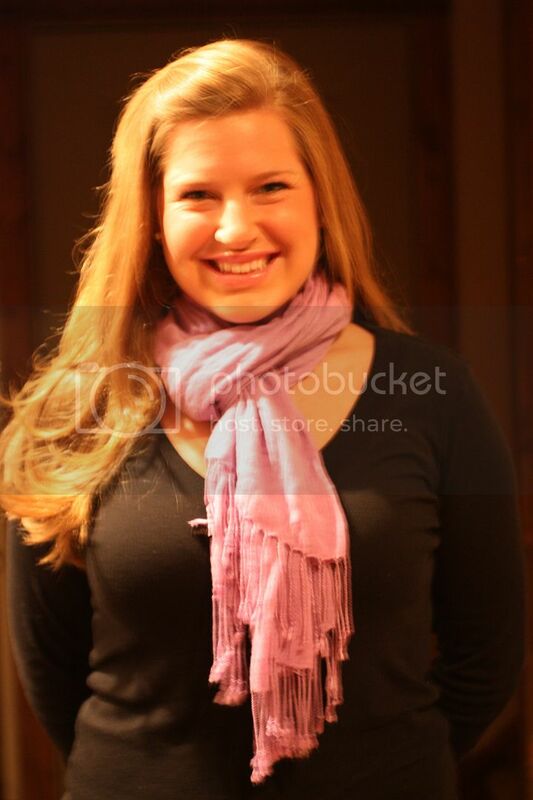 My gorgeous niece, Amanda, who’s home from college in NYC, shares that scarves are everywhere. She also illustrates my point – simple, yet sophisticated. Are you wondering how to do this easy knot? It’s a simple loop. Fold the scarf in half, wrap it around your neck, allowing one half an opening. Then just loop it through and pull. I was going to crop this photo, but in the interest of keeping it completely real with the bedlam in my life…yes, those are cords over my the door leading into my master bath. We needed to hook up a computer in an adjoining room that didn’t have a phone jack, and it’s just not the time to install one now. 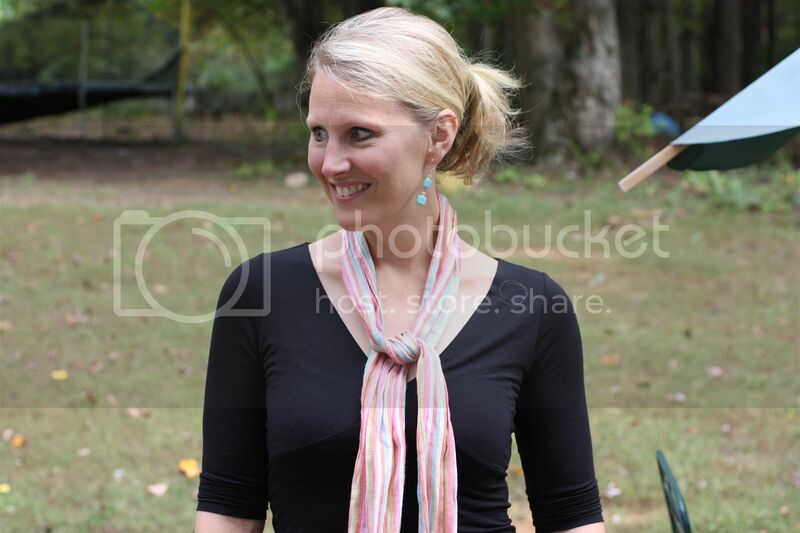 Here are a few photos from previous Frugal Fashionista posts that feature scarves. One of my “go to” core wardrobe pieces involves the LBD – Little Black Dress. I recommend every wardrobe having one. AFter – All that happened with just the addition of a scarf. My sweet (in)courage friends. Check out the Nester and Steph’s great scarves. There are so many different uses for scarves. Try using them as a belt, tied in the hair, or tied onto your purse for starters. I also love to simply wrap them around my shoulders for an elegant accent. 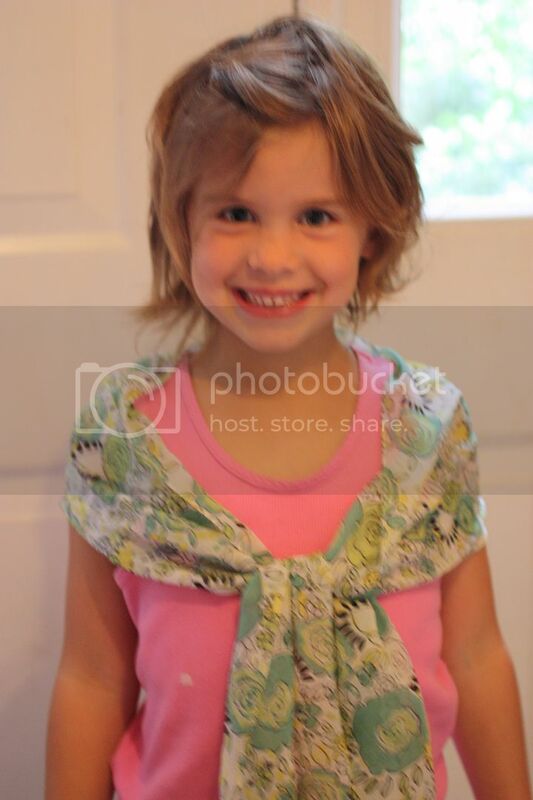 And of course, my littlest Frugal Fashionista did not want to be left out of the mix. I don’t follow the trends in Hollywood, but celebrities are loving scarves as well. Some are very reasonably priced, and for the pizazz that it adds to the simplest of clothing pieces, it’s worth the investment. So my frugal fashionista advise for the day? Experiment with a few scarves this season, you won’t be disappointed. Oh, gosh. My thoughts exactly. I inherited all of my grandmother’s really cool scarves. She was a really snappy dresser in the 40s-60s. Nobody else wanted them, so voila! I’ve been wearing them ever since the late 80s when she moved to smaller quarters and none of the other women in the family wanted them, and I have since amassed quite a collection of my own. My daughters are also on the bandwagon (incl. Goodwill, et al), and scarves are something that can be shared, regardless of dress size (honestly, my daughter wears a 3 long. What an impossible size!). Fun, fun, fun post! I always thought that shirts like that black one are supposed to have the seams sitting under your breasts. Kind of empire like. I pass up a lot of shirts b/c the seams sits half way up my breasts and it seems like it doesn’t fit (I also have large breasts though, so often it really doesn’t). I am chuckling because I’m sure the seams are supposed to sit lower, but when it was where it was “supposed” to be, it was too low. It looked “great” in the eyes of many, I’m sure, but I felt uncomfortable. So, I pulled it up just a bit and it works for me. (Even if it’s not “supposed” to be like that.) 🙂 It’s such a comfortable shirt, just couldn’t pass it up. I am sitting here in my $2.00 Ralph Lauren sweater from my favorite local thrift store lamenting some gorgeous scarves I gave to Goodwill just a few years ago! Being the newbie blogger that I am, I just realized that my comment is linked to the WRONG blog!! How’s that for bedlam? So here’s my comment again if there is any way to fix this! My $2 Ralph Lauren sweater is in desperate need of one of the scarves I gave away years ago! Thanks for patiently reading this! I think I will see scarves in a whole new light now! You find the best bargains! I’m going to dig out some scarves that I have stashed here and there after reading this post. I finally stepped out of my comfort zone and decided to give the scarf thing another go. And guess what? I like it now. Everyone compliments this one I got on clearance at Dots for $2 a few years back (last time I tried out scarves). No one is the wiser that it was not bought this season. You look great in all of them! I’m afraid I might die if I wore a scarf around here. 🙂 I do love them and usually wear them when we travel. You have a fabulous selection!!!! 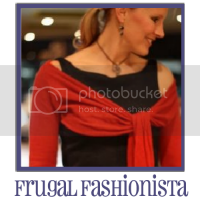 I love, Love, LOVE your frugal fashionista posts!!! You inspire me to dig deeper at the thrift store and find the real treasures! I’m with you…I love a good scarf! I have TONS of them. They are so fun and easy to use with pretty much any outfit! I am always AMAZED at the deals you find!! They look amazing and I love the accesories! The totally make the outfit! I’ve been saying for what..a month?? that I was going to hit a thrift store and guess what! Today I finally did! It was fun. I had a good time and bought a few things. 🙂 I tried to remember all of your lessons. 🙂 When I was paying I noticed that Fridays everything is 75% off so I’ll keep that in mind for next time! If you are interested I did a couple of short videos about all of this on my blog. The first one is *A New Adventure* and the second one is *A New Adventure Part Deux*. I promise they are very short if you want to check them out! Okay, first off I love your site it has encouraged me to shop thrift way more. Today I was out looking at my local thrift store because it is an extra 25% off and I found a cashmere sweater and it cost me $3.50, plus I purchased a pair of Talbet pants for $3.50 also. I had to tell someone, no one I know really cares. Thanks for your great work. 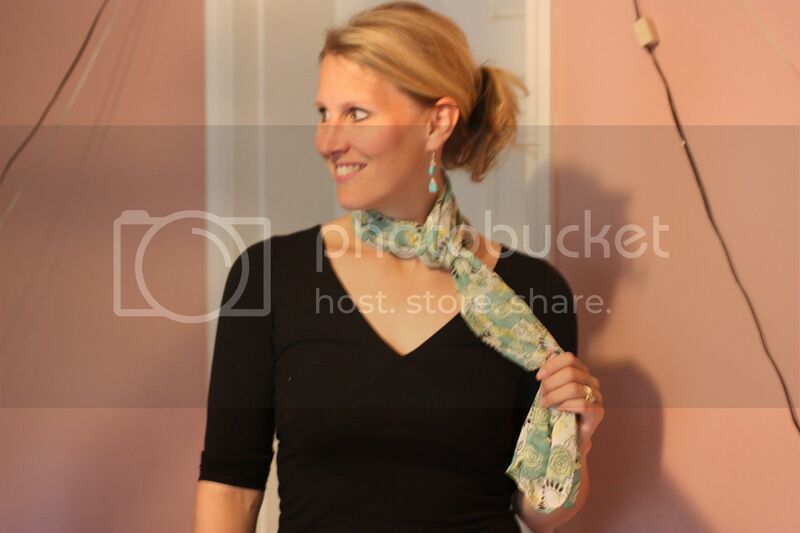 Another cheap alternative to a scarf is to love on your sewing/knitting gifted mama!! 🙂 I have several gorgeously knitted scarves my mom made for me. I’ve only ever bought one scarf and it was this past Spring at Old Navy – their scarves sometimes go on sale for $9-ish and they are super cute – floral, stripes, solids, etc. I heart scarves, especially woven in bright patterns and colors, but then again, I love the soft silky ones too. Thanks for the shout out friend ! I love scarves! My favorite is a leopard print l-o-n-g one my eldest daughter made me buy several years ago at H&M. That was a real coming out of your comfort zone for me! I have gotten so much use out of it. I actually have a drawer full of scarves at this point. Oh boy! A frugal fashion link up! Can’t wait! Now who can I use for a model? 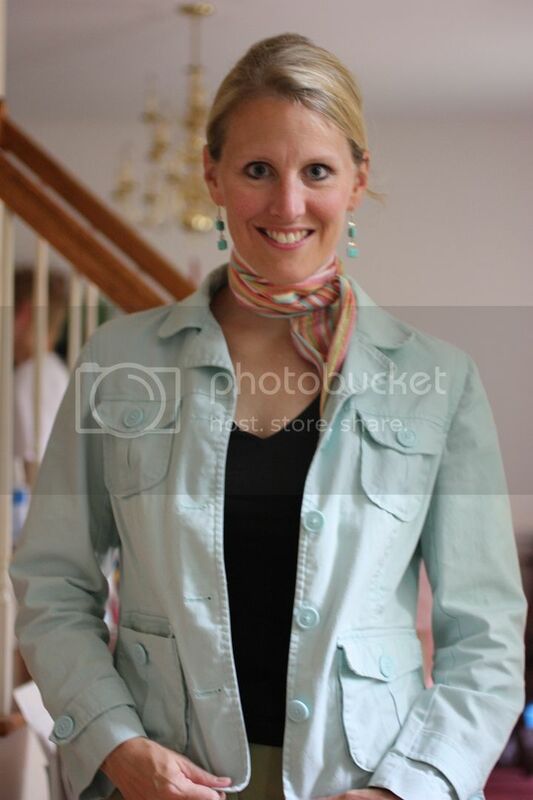 LOL Cause I tried to get a photo of my oh so neat-o Goodwill jacket find ….well, let’s say I look tired! I love scarfs and am thrilled they are back ‘in style’. I’ve seen some solids advertised at Big Lots for $5 for shopping on the ‘cheap’. You are so funny with your post. Loved it. Scarves are the forgotten fashion accessory. I noticed over the summer that everyone was adding them to their outfits. They can really make a boring outfit pop. 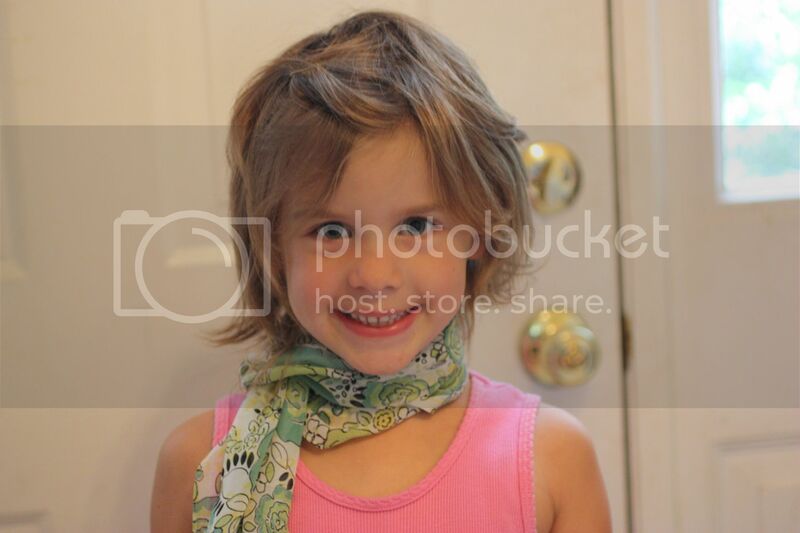 So cute that your little lady can put the scarf on by herself. She looks so fashionable. Very nifty. But I would never wear any of those. I love good will and scarfs, I think you are my new best friend. Really 80% of my wardobe is from second hand stores. Can I tell you I have about 20 scarfs..all weights and colors for every season. Me and my daughter both love them. I’m curious about the orange/red scarf/bolero you are wearing in the photo at the top of the page – the one with sleeves. Could you post a photo that shows the details of that piece? What exactly is it? It looks fantastic on you, and I think would on me too!